← Accurate portrait or thorough research? Hunting around for suitable and legitimate images for a presentation can be a frustrating experience. There’s lots of stuff on the internet, but can you re-use it for your purpose? Fortunately IOE staff and students have several sources available (see the listings on our web page). 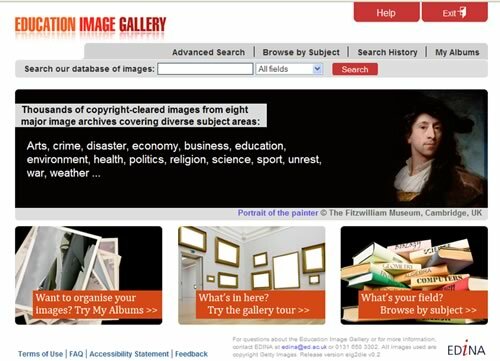 Our key source, Education Image Gallery (EIG), has however changed recently, and is definitely worth a look for new and returning users. With a new front-end and content, the EIG service is building towards the launch of a new JISC multimedia service, tentatively named Mediahub. Media enthusiasts might like to keep an eye on the EDINA Mediahub blog for news of developments. This entry was posted in Library and Archives and tagged Education Image Gallery, image resources, still image. Bookmark the permalink. 1 Response to Image problem? Worth looking at the advice from JISC Digital Media on still image finding and use.